The man before me is a professor of Jewish studies at a major university; he is scooping out bites of ice cream between his words. Despite his studied indifference, he is more than casually interested in the conversation. We are at a reception at the college and he knows that I am a Reform rabbi and is hoping to bring some clarity to an issue that has nagged at him. “Why was that?” I asked him. I took a swallow of ice cream to give myself a moment to think. “Well, if the positive energy is outnumbered and surrounded by the negative energy, there’s not a whole lot that you can do. “It’s not the prayerbook’s fault,” I told him, “nor is it the rabbi’s fault, nor is it the bar mitzvah kid’s fault – rather, you need to have an excess of positive energy in the room in order for prayer to be meaningful. If the majority of people are there to be entertained, real prayer cannot take place. “You can ‘save’ that kind of situation, but only if you find some way to bring the observers in, so that they feel they have a genuine connection to what is going on. In the context of a bar mitzvah, the best approach is to tap into the love and concern they have for the child standing before them. It seems odd, of course, to be speaking in terms of positive and negative energy, as if the activity in this room creates its own kind of current that might somehow be sensed by the persons seated here. The interesting thing, however, is that our tradition does speak in such terms. That is to say, our tradition argues that there is a world of the spirit that announces itself to us, which makes us cry at weddings and baby namings, which brings up that feeling that our little heart would just overflow. It is the source of our strength, and the tap root of our existence. It is the energy that animates our prayers. Its most common name in Hebrew is shefa, but it goes by many others as well – it denotes the indwelling presence of God. Prayer is more than a meditative device for the purposes of achieving inner serenity. Prayer is also more than just emotion. According to Abraham Joshua Heschel, prayer specifically invokes God’s presence. As Heschel writes,“feeling becomes prayer in the moment in which we forget ourselves and become aware of God.” The very mark of prayer is this experience of self-surrender. What we are seeking in prayer is to let go of our self-concern so as to be able to view the world from God’s perspective. Then we are able to put our own cares aside for a moment and recognize how our own selfishness might cause us to act in ways contrary to the will of God. We are able to engage in self-criticism, to mend our ways and take up God’s aims. If we let God’s will take over, if we truly view the world from God’s perspective, then we cannot walk past people who are starving without taking action. We cannot allow the kind of imbalances we see in this country between rich and poor. And we cannot allow discrimination, fanaticism, or hatred to rule our decisions. It is in the prayerful encounter with God that righteousness is born. The urgency of this task explains why we need the community to stand and pray next to us: the surest way to let go of our self concern, to stop striving long enough to hear that still small voice within, is to pray in the context of a community – to participate in that electric feeling of communal prayer. It is so much easier – and so much more effective – when you don’t have to try to do it all alone. Which brings us back to our professor, and his prayer. The gathering that came to watch the bar mitzvah that morning was a group of disinterested strangers, evaluating the performance of a thirteen-year-old reciting long passages of Hebrew. What he was seeking, however, was a community of prayer. First is the regular cultivation of the habit of prayer. A friend once confided in me that he stopped going to services on any kind of regular basis because he felt alienated from God, and alienated from prayer. And in the course of that long conversation, one of the things I told him was this: you are not going to move past this point if you are elsewhere while your community is engaged in prayer. Go and be silent if you must – eventually your soul will catch up to what your body is doing. If what you are seeking is closeness to God, then seek closeness to your community first. Second is the recognition that prayer does not require perfection. It is not a problem if you’re not the best at meditation, or your Hebrew is nonexistent, or you sing off-key. What is needed is that you are here, truly here, in this moment, now. Not at work, not reviewing your to-do list, not in the midst of an old argument replayed once more in your head. Just try to be truly here. Third is the openness to the transformative power of prayer. It is not something that happens right away, but rather by degrees, in small amounts. Just like dancing, there will come a point when you stop counting time and just do. And when an entire community engages in that dance – that moment is electric. It is in that moment that you will know in the very center of your soul that you’re not alone. There is a Bible story that we do not often hear told because it is not for the ears of children. 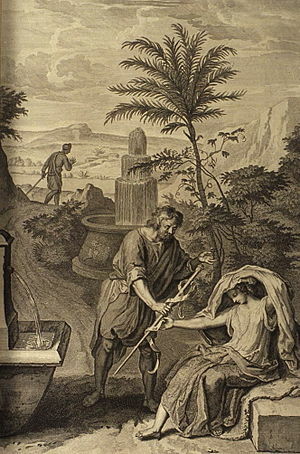 It is the story of Tamar, the first Tamar, and her relationship with her father-in-law Judah. Tamar marries one of Judah’s sons, and the son dies; she marries a second son and the second son dies. By the logic of the biblical culture in which she lives, she should then marry the third son, who would impregnate her and provide her with the male heir to her dead husband’s estate. She also needs this heir to be properly cared for in her old age. This arrangement, called a ‘levirate marriage,’ also figures prominently in the story of Ruth. After the woman produces an heir, the pair never engages in relations again. But, when the time comes for Tamar to marry the third son, Judah balks. He withholds his youngest son, sending her back to her father’s home with a vague promise that he will arrange the marriage when his son is older. But he never gets around to doing so: perhaps he thinks that she is killing the sons; perhaps he believes that she is bad luck; perhaps his youngest son has begged him not to go through with it. So he continues to stall. Judah’s other option, of course is to release her from his family. That is, he can cut her free from the obligation to marry the youngest son, so that she might marry someone else. But that is a dishonorable thing to do in his culture, because it means that his first son, her first husband, will never have an heir. Stuck, Judah does nothing: he condemns her to the lengthy wait and denies her the ability to move forward with her life. But Tamar is not one to wait. She tricks Judah into impregnating her unknowingly by wearing a veil and pretending to be a prostitute. She takes his rod and staff as pledge for payment, and then disappears. Months later, the fruit of her deception becomes known: word gets back to Judah that Tamar is pregnant. Indignant (and perhaps relieved that he may be rid of her) he demands that she be burned. She was promised to his third son – it was an engagement, after all – and her pregnancy by another man during this period of engagement qualifies as adultery. Why does he say that? Filtered through our modern lens, we assume that his declaration has to do with his own infidelity with regard to the prostitution. But in context, the real infidelity here is his unwillingness to allow her to provide an heir for his first son. This question of lineage is of paramount concern, and he has not provided sufficient attention to his family’s line. She understands this situation better than he does. She also realizes that Judah is also able to fulfill the duty of providing an heir, and sets a process in motion by which that might happen. And here we see how much has changed since the time of the Bible: she had indeed operated within the bounds of the biblical law, despite her ruse and despite her prostitution. The narration then bestows upon her the highest honor available to the biblical woman: she gives birth to twin sons. And that line, in turn, becomes the lineage of the house of David. Even beyond Judah’s declaration that she is more righteous than he is, she is also greatly rewarded for her efforts. I mention this story for a couple of reasons. The first is to highlight how biblical assumptions are much different than our own; we would condemn her willingness to resort to trickery, her intention to seduce her father-in-law, and her decision to play the harlot. But her reward – and Judah’s response to her pregnancy – each demonstrate that our first impressions would be wrong. We should note here (and note well!) that the biblical concept of marriage is very different than our own institution in its current form. That’s a theme I intend to return to later. But what prompted this retelling of the story is a different issue entirely. Up until Judah’s declaration, he had not thought of her as a person in her own right. She was a problem to be resolved, just another one of the many people under his care. He does not ‘see’ her. He is not aware of the burden of waiting, of the suppression of desire that she must endure, of the uncertainty of her future. Her full reality – the lived experience of her life – has no meaning to him. It was not until she confronted him with the tangible evidence of his not-seeing-her that he realizes his blindness: She has achieved something of great value to him without his cooperation. She wears a veil before her eyes, yet he is the one that does not see; he is the one who may go out and visit the wide open places, yet she, cloistered in her tent, is the one with the foresight to see what is on the horizon. The experience of the one who is suppressed – in this case, the woman who has no power in her own right – is not visible to the one who controls the situation. He is not able to see the effects of his decisions (or lack of decision) on her daily life, and he is not able (at least at the outset) to feel empathy for her plight. All is well in his world; why would it not also be so in hers? But sometimes what is most needed in order to effect change is the tangible proof of oppression. In this narrative, Judah suddenly ‘sees’ her, in her full humanity, and renounces his power over her life, freeing her. The story of Tamar offers the genuine hope that the dominant authority (in this case, the patriarchy), might suddenly give way, having gained that flash of insight as to how his actions have contributed to her plight. But what we should pray for – and what we should work toward – is the gift of insight, the gift that we might immediately ‘see’ those around us who are hiding. Who among us must remain veiled? Who among us are not able to be visible at ‘the opening of the eyes?’ Who among us have been oppressed by our assumptions? This post was drawn from my experience teaching ‘Women in the Bible’ as adjunct instructor for the Judaic Studies Department at the University of Cincinnati, using texts from Aschkenasy and Frymer-Kensky. Your theology defines what becomes possible in your life. To give an example, one that I tell my undergraduates when I am teaching: If you believe in miracles, then miracles can happen in your life. And if you do not, then they do not. I do not intend that my comments here should be taken as a form of magical thinking; rather, I mean that your decision as to whether or not miracles are possible defines whether or not events will qualify or not qualify as miracles in your life. So the question arises: what kind of world, and what kind of life would you want? In the Torah narrative, for example, Joseph is sold into slavery by his brothers. He is falsely accused and imprisoned. His early life is a series of tribulations, most of which arise on account of jealousy and ill feelings regarding his capabilities and his virtues. But he is not one to despair, and he is able to rise up to a high position though his wits and foresight. When his brothers arrive in Egypt, he is second only to Pharaoh. He could have them killed, of course, or imprisoned. Instead, he decides to test them, to determine whether they have any regret for their earlier actions. After a couple of ruses, he is satisfied that they would not leave his youngest brother behind, and he reveals himself to them, weeping. They reunite. But there is still a current of mistrust: Later, after their father has died, the brothers beg for their lives. They make up a story, convinced that he has been waiting for this moment to exact his revenge. He tells them: What you had intended for evil was transformed by God into good. The jealousy that led you to sell me into slavery ultimately became the catalyst for saving a population from starvation. Notice that he does not argue that things had to happen this way. Notice also that he does not pretend that they had good motives, or that their actions were any less destructive than they actually were. Rather, he has created a theology that allows him to heal and forgive, by assuming that God has transformed all the negatives into something positive. Even in the darkest depths it is possible to remake the situation into a lasting good. I retell this story to make a point: a person’s theology defines what is possible. Joseph’s theology allows him to forgive his brothers and to overcome the tragedies in his life. What does your theology allow you to do? What does it make possible? And, in turn: What does your theology demand of you? I have not always been able to pray. As a young adult, I had deep problems with the concept of God and the concept of prayer. I would call myself an atheist because I simply could not conceive of a God worthy of genuine prayer. Even when I found my way to Judaism, I was still not immediately able to pray. What changed my life, however – what put me on this path first as a Jewish seeker and ultimately as a rabbi – was a book of Jewish theology. One evening, in a discussion at the Temple, I was explaining my views on God and advocating a very rationalist point of view. In response, my rabbi observed that I agreed with Maimonides. So, during a business trip, I saw a book about Maimonides, written by Abraham Joshua Heschel, and I picked it up to read on the airplane. I really liked the book; so, when I saw another one of Heschel’s books, I bought that one too. I believe that the second book I picked up was God in Search of Man – but I am not entirely certain, for I devoured several of his theological works in rapid succession. It could have been Man’s Quest for God or Man is Not Alone. What I found so persuasive was the idea that the path to God is through wonder. Heschel points to our sense of awe at the everyday, such as the sight of scarlet and orange leaves during in the fall, or the sound of a small child’s giggle, or the delicate taste of a fresh peach. And he describes our feeling of radical amazement, such as those moments when we stand before the ocean or see the valleys stretch out below us from the mountaintop. These are the first steps toward appreciation of the divine, because they point to a realm beyond our understanding, a realm in which we feel a kinship with the world around us. The purpose of prayer is to become aware of these moments, those moments in which we are no longer locked within the confines of our own needs and desires but rather united with the whole of life. In prayer, we are attempting to rise above ourselves, to transcend what we are capable of doing alone, to seek that which is more meaningful than our passing existence. Prayer also allows us to voice that feeling of sheer gratitude we feel just to be alive. Of course, sometimes we feel more grateful than at other times. One year, I was invited to speak at a Jewish day school about prayer. At that time I was recovering from ankle surgery and – thinking that the kids might be curious about my bright purple cast – I decided to speak about the prayer asher yatzar, the prayer thanking God for our ability to stand before God and pray. As the prayer explains, if one of our tiny openings were to shut — or one of our closed places were to open — we would not be able to stand. As I explained to the assembled students, I find that I now understand more precisely what that prayer means, being as a small set of ligaments maybe a centimeter long were able to sweep me off of my feet. After that ordeal, I now have a much greater appreciation for the ability to walk on uneven ground without falling – and I am still afraid of high heels. But, as the prayer reminds us, we tend to take our health for granted – at least until something slows us down and causes us to reflect on how vulnerable we really are. The cycle of the High Holiday services is when we pause to reflect on that vulnerability: as the liturgy intones, this is the time of judgment, when our deeds are weighed in the balance and our fate is determined for the coming year: who shall live and who shall perish, who shall see ripe old age and who shall be cut down in the prime of their youth. Affirming the sovereignty of God means accepting that your life is not your own possession, but rather a loan. We have ownership this life temporarily, but we will have to return it with interest. As with all loans, there is something demanded of us. In the days leading up to my ankle surgery I fretted a lot; I was worried about it. My husband mused on the fact that I believe that God created the whole world and everything in it, and yet it would appear that I am deeply concerned that God is not sufficiently involved in the details. I giggled at the thought of such a contradiction and then said, yes exactly; evidently there is some chaos built into the system. The outcome is, at least at some level, wholly unpredictable. Who knows whether the surgery will go well or not? I do get the sense, however, that built into the structure of the cosmos is a kind of delight in our endless surprise, our ability to create whole new possibilities out of the materials we have been given. Otherwise, I would think that being all-knowing would get to be rather dull after a while, sort of like playing tic-tac-toe against yourself. But then again, who can say whether God has emotions? If God does have emotions, then also there would also be surprises that would be much less welcome to God. What happens when we choose badly? In judgment, before whom do we stand? We know that there is something demanded of us; we are to be just, to act uprightly. We are commanded: Love your neighbor as yourself. Do not stand idle while your neighbor bleeds. If you see your enemy struggling to keep a load from falling, help him. Do not put a stumbling block before the blind. Keep honest weights and measures. Do not oppress the stranger, the orphan, the widow – or anyone else who is vulnerable, for that matter. It would seem to me then that the act of affirming the sovereignty of God means affirming that there is justice demanded of us, even in the face of a chaotic world. The fact that we cannot be certain in advance of the outcome of a surgery does not mean that there is no God, or that God has no concern for us, or that God is not all-powerful—or that we are free to behave as we please, consequences be damned. There are indeed consequences. Do not ask me to explain them to you, however, in some kind of neat phrase which sums up why bad things happen to good people. Chaos is built into the system and sometimes truly hideous things happen to perfectly good people. And, as far as I am concerned, any theology that can confidently explain why children should get cancer is a monstrosity. Affirming that there is moral coherence in the world is not the same thing as affirming that all of the loose ends will tie up neatly. What I am trying to say is this: I can pray intently for healing, but I cannot make a deal with the Divinity to live to see my great-grandchildren, nor can I make an arrangement on behalf of my own children that they should see no harm. The fact of the matter is, our material world is just so much more changeable than that. The chaos in the system makes it impossible to predict the outcome, particularly from our vantage point, and sometimes things go horribly wrong. But even so, the actions we take matter in ways that are fundamentally important because they directly affect the quality of the world around us. In fact, it is Heschel who argues that each of our actions has the potential to disclose the holy, to transform the world in small steps. In Heschel’s view, even the smallest religious rituals matter to God; it is in these kinds of small acts that we invoke the Divine and bring God into our lives. In that sense, God is in need of humanity so as to put this process into motion, to allow this transformation to happen. Prayer is profoundly important precisely because we are God’s much-needed partners in the redemption of the world. What was so profoundly moving for me in reading Heschel all those years ago was the exposure to a deeply religious person who was also spiritually honest. In the place of neat answers and tidy constructs, Heschel asked searching questions and demanded honest answers. In the context of his prose, I encountered a genuinely pious Jew who could pray, really pray, even in the wake of tragedy, even in the wake of great pain, even as a refugee who lost most of his family in the Holocaust. And so I imitated him, as best I could, in little steps. I did not start out knowing how to pray. At that time I did not yet know Hebrew or the mechanics of prayer. I was still deeply alienated from God. But the attempt to imitate Heschel, to imitate his life and his way of prayer, was what lead me to this life, where I am now, a rabbi and a profoundly committed Jew. And, in that sense, prayer has changed my life, in the most radical way. For urbane folk, theology seems like an optional pursuit, something that might be considered while skipping stones across the face of the water, or in the late hours of a dinner party, after the wine and before the cake: ah yes, let us talk about God. But really, outside of those isolated moments, why should we care about theology? What difference, really, does it make if we were to think of God as a bearded gentleman or as an invisible force? Why should it matter whether someone thinks one thing or another about God? We are, after all, in a post-modern-post-politically-correct era, a time of tolerance. Reform Jews are savvy and connected, aware of practices across the globe, knowledgeable about the staggering variety in practice and belief. The practice of theology seems, well, just so parochial, in the fullest sense of the word. Why should we care about theology? For many of us God seems to be absent, aside from the role God plays of symbolic placeholder in our prayers, appearing as a part of a phrase that bridges the blessing and the mitzvah. Yet, at the same time, our prayer language is indeed the language of God-belief, of God’s active involvement with a people Israel. We had a deal. And yet it was not observed. And this breach is a still-painful wound. Out of a longing for a missing God or out of an inchoate desire to find what is truly authentic, we might commit ourselves once again to some kind of practice, a renewal in the wake of a life cycle event. But this retreat into the baroque pleasures of observance does not help with the theological problem, which is why such bursts of enthusiasm are often so short-lived. We need a new narrative, a story that we tell about the nature of the world, one that has the power to shape our understanding and to guide our commitments. Theology is needed because it defines what is possible in our lives: the experience of miracles or of no miracles. A landscape illuminated with the divine or a landscape that is not. A life lived within the context of God’s presence or a life without. Theology is more than a story about God; rather, it is an explanation of our expectations. More specifically, theology answers the difficult questions of purpose: Is this the best of all possible worlds? Or do we believe that the world can change? Do we hold out for the possibility of redemption from all that is inadequate, deficient, and broken, or do we accept life as it is? Theology also answers the difficult questions of exegesis: How do we read the Torah? How do we decide what is literal and what is metaphorical? Our need to know is more urgent than idle interest, and runs deeper than nostalgia. One that makes sense of the distinctions between the people of Israel (Am Yisrael), the land of Israel (Eretz Yisrael), and the government of Israel (Medinat Yisrael). The three are not synonymous, of course, and it is not obvious where our loyalties lie. What is included in the definition of each? Are they equally important to us? Are there situations where we would choose one over the others? Is there an absolute in this relationship – a line that may not be crossed? And how do we handle dissent and dissonance on these issues? One that explains the concept of commandment. The implicit danger of the informed choice model is the potential for devolution into anarchy. We continuously face the accusation of succumbing to mere laziness rather than engaging in principled decision-making. At the same time, we cannot enforce dogma, and would find it morally repugnant to do so. Another model is needed, one that emphasizes the voluntary aspects of affiliation while encouraging consensus of some kind regarding these choices. How might we redefine the concept of reform? One that investigates the concept of covenant. What kind of relationship do we have with God? Is our model that of a covenant, and if so, is it an inclusive one? Does God play favorites? Or do we recognize a universal ethic? How do we resolve the tension between a particular covenant and a universal mission? And how do we go about healing in the wake of a breach in our understanding of the covenant? What we do not need, however, is bad theology. We do not need the kind of theology that leaves us wounded with no structure with which to rebuild. We do not need the kind of theology that convinces us that we have the right and obligation to dominate others, to make them bend to our will. We do not need a theology that forces us to defend the indefensible in the name of tradition. What we need is a theology of purpose that answers these questions, shapes our exegesis, and defines our agenda. You are currently browsing the Essays category at Godtalk.